Steamed broccoli is a wonderfully easy and nutritious food. Luckily, steaming broccoli is super easy. There are three fast methods to steaming: in a pan, with a steamer, or in a microwave. Find the one that works best for you, your taste buds, and your lifestyle. 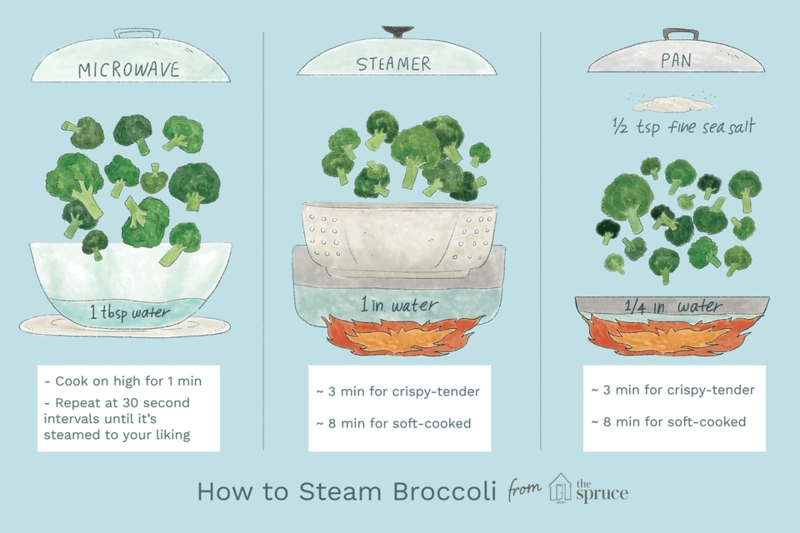 This is by far the easiest way to steam broccoli and leads to the perfect texture. Bring about 1/4 inch of water to a boil in a large frying pan. Add about 1/2 teaspoon fine sea salt and at least a handful and up to 2 pounds of trimmed and cleaned broccoli florets. Cover and steam until as tender as you like (about 3 minutes for crisp-tender and up to 8 minutes for completely cooked, soft florets). The classic method of steaming uses a steamer basket or insert. Bring about an inch of water to a boil in the bottom of a pot into which your steamer basket or insert fits. Put trimmed and cleaned broccoli florets in the steamer basket, set over the boiling water, cover, and steam until tender to the bite, about 3 for crisp-tender and up to 8 minutes for fully tender florets. Steaming broccoli in a microwave is certainly quick and convenient. With the microwave is more difficult to get vegetables steamed to a precise and even level of doneness. Put freshly washed broccoli florets with water still clinging to them in a large microwave-safe bowl. A small pool of water should form in the bottom of the bowl. If you don't see water in the bottom of the bowl, add a tablespoon of water. Cover the bowl with a microwave-safe lid or plate (avoid plastic wrap in microwaves) and cook on high power for 1 minute. Test for doneness and repeat at 30-second intervals until the broccoli is steamed to your liking. Broccoli steamed in a microwave may require a bit of draining or drying depending on how much liquid you used and how powerful your microwave is. Besides eating the broccoli on its own, steamed broccoli makes a great topping for a baked potato, a colorful addition to scrambled eggs, or enjoyed cold in a raw vegetable platter with a dip. It can even be mashed up and added to mashed potatoes for a healthy pairing. Crisp-tender broccoli will last longest if it is cooled and dried prior to storing in a sealed container in the refrigerator. It does not freeze well and will likely defrost as a mushy mess.